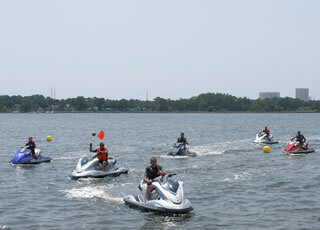 You get the maximum fun from your jetski by teaching you how to drive safely and responsibly. You have fun! after all, this is what it is all about. You qualify for cheaper insurance. This internationally recognised certificate can help reduce insurance. You can launch your craft. RYA training is now required by many port authorities before access to the water is permitted. Under 16's will be issued with an endorsed certificate. Course Length - 1 day Certification - RYA Personal. Ability after the course - Proficient in good conditions. Practical Familiarisation Control at slow speed. Capsize and righting Control at speed. Following a planned route identifying buoys and marks. Recognising potential collision situations and taking correct avoiding action. Orientation at sea including subjects such as charts, buoys, tides and compass use. Courtesy to other water users.